Charleston is at a crossroads. 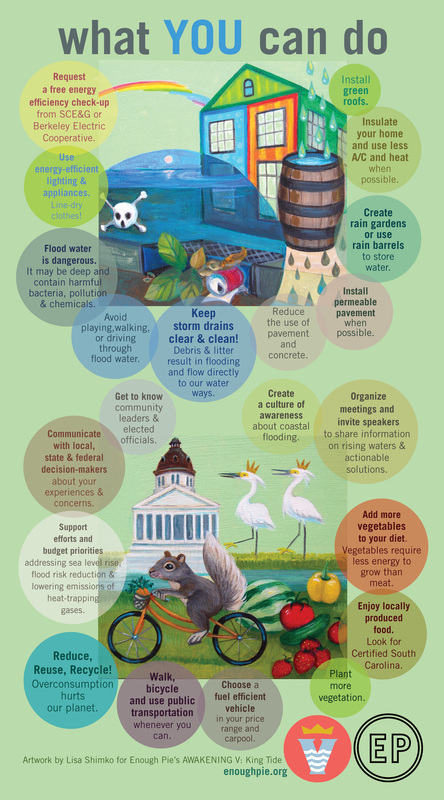 Flooded streets and rising waters affect us more and more. 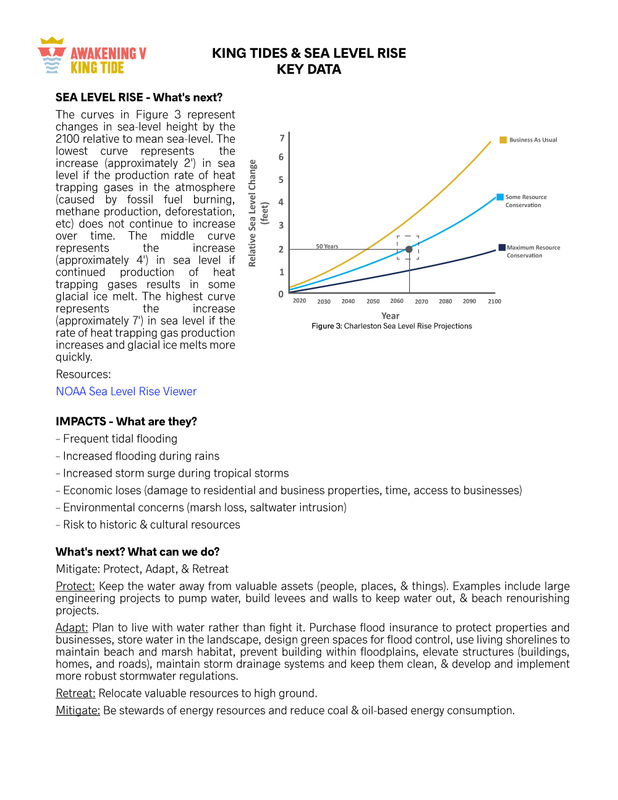 By 2045, Charleston will experience sunny day tidal flooding 180 days out of the year — averaging every other day. * The decisions and actions we take NOW as residents of the Lowcountry are critical to our future. Enough Pie has assembled a team of artists, scientists, organizations and thought leaders to shine a light on rising waters through public art, parades, lectures, and events from April 29-May 26 across the Upper Peninsula. All are welcome as our programming is free. Do not miss this moment to make a difference. Join Dr. Rob Young of Western Carolina University for a deep dive into the policies of sea level rise and what is being done about it. Dr. Young will offer a lecture followed by a discussion. Like all Enough Pie events, this is free and open to all. Join us to create art, knowledge, discussions and community resilience together! 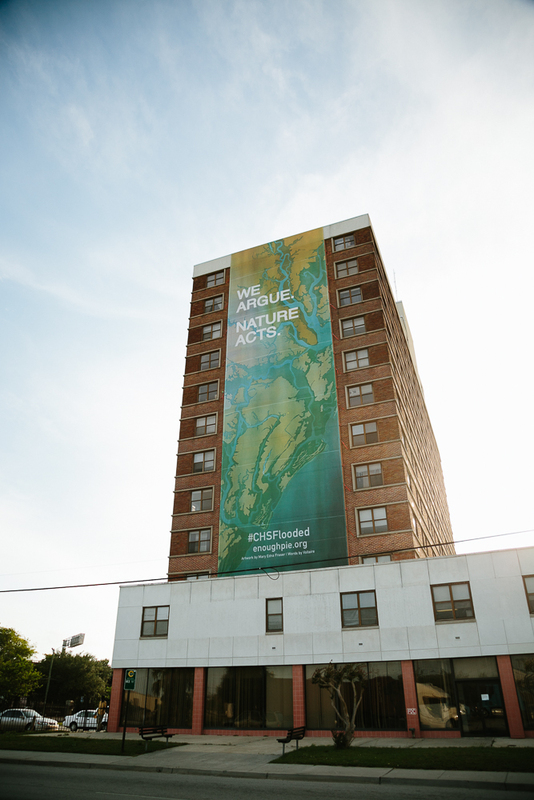 This project has been made possible by the dynamic team of CULTIVATE and with support from the Coastal Conservation League and DHEC Ocean and Coastal Resource Management. 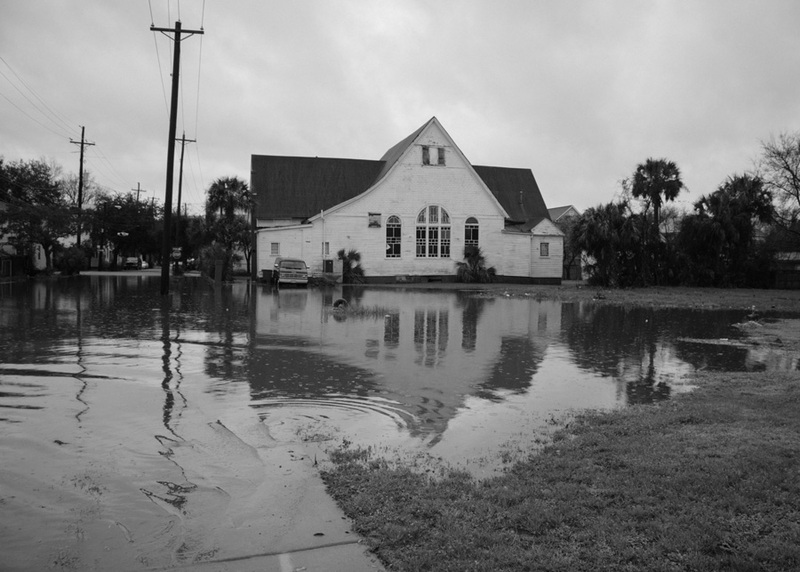 Sunny-day flooding, hurricanes, king tides—Charleston’s neighborhoods are increasingly at risk and experts say it’s going to get worse. A lot worse. But you might be asking yourself, what can a beginner like me do when experts—scientists, economists, and politicians—are deadlocked in disagreement and controversy? Join Spiritual Ecologist Heather Lyn Mann, faculty for The Sophia Institute and member of the Contemplative Alliance, for conversation about the growing role of spiritual people and communities in protecting creation. Learn how more and more people of faith see themselves bound in sacred trust with creation, feel called to protect what is sacrosanct for this and future generations—fresh air, fertile soil, clean water, and the multitude of life forms in our midst. Hosted by Unspoken Word, local poets, slam performers and rappers gather to express life in a city faced with rising waters. This event is all ages and free to the public. Historic Charleston Foundation presents Christina Butler, an accomplished historian and preservationist, to discuss an illustrated history of the growth of the Charleston Peninsula. Parking for this event is off of East Bay Street on Lee Street, north of the Cigar Factory. This event is free and open to all. 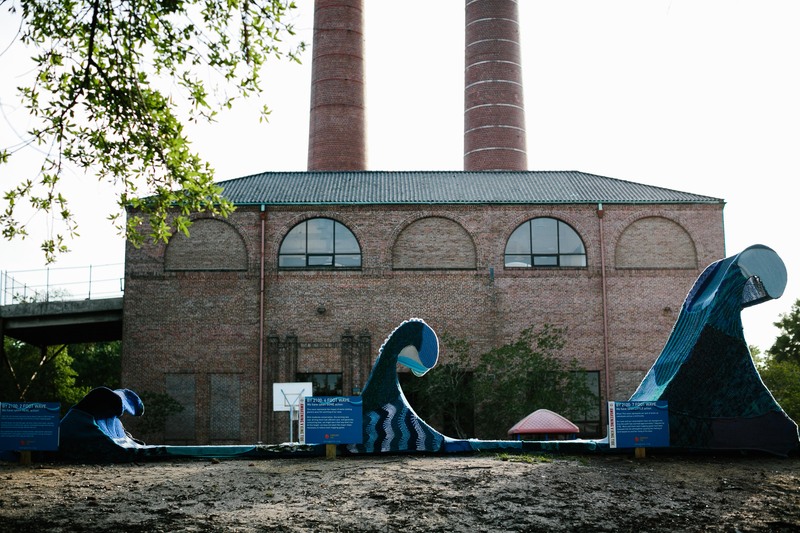 “Rising Tides” is a visual presentation focused on Charleston’s frequent flooding, with local scientific research. As an environmental activist, my art stimulates social change. Batiks on silk and oil paintings of threatened landscapes educate about sea level rise through my collaboration with Duke University’s Orrin Pilkey in Climate Change: A Primer. How are we are facing this future as a community? 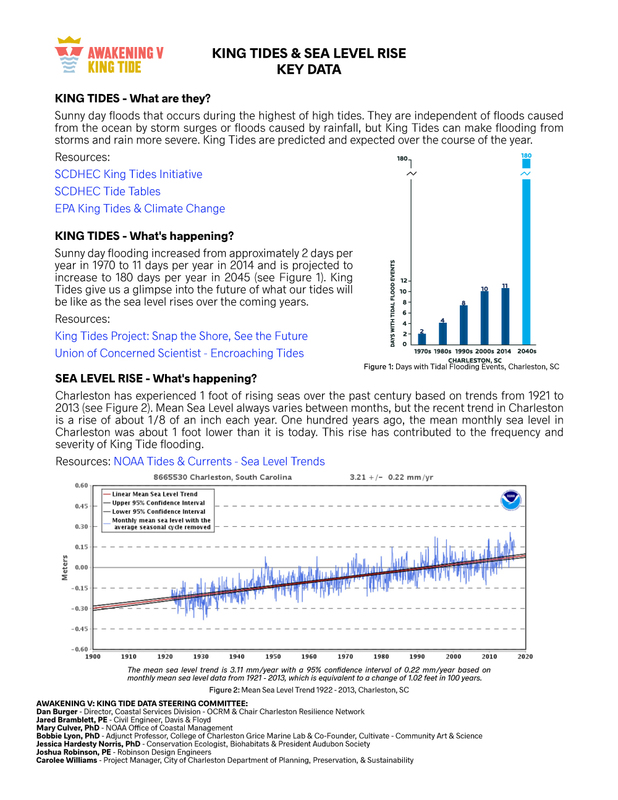 Let’s awaken to the reality of increased frequency of king tides to survive.This event is free and open to the public. Charleston artist Mary Edna Fraser’s batik artwork will hang on 100ft all-weather banner at the Joseph Floyd Manor accompanied by bold messages to shed light on sea-level rise. Lowcountry artist John Duckworth presents a large-scale, multi-media immersive art installation linking the melting glaciers to Charleston’s flooded streets. 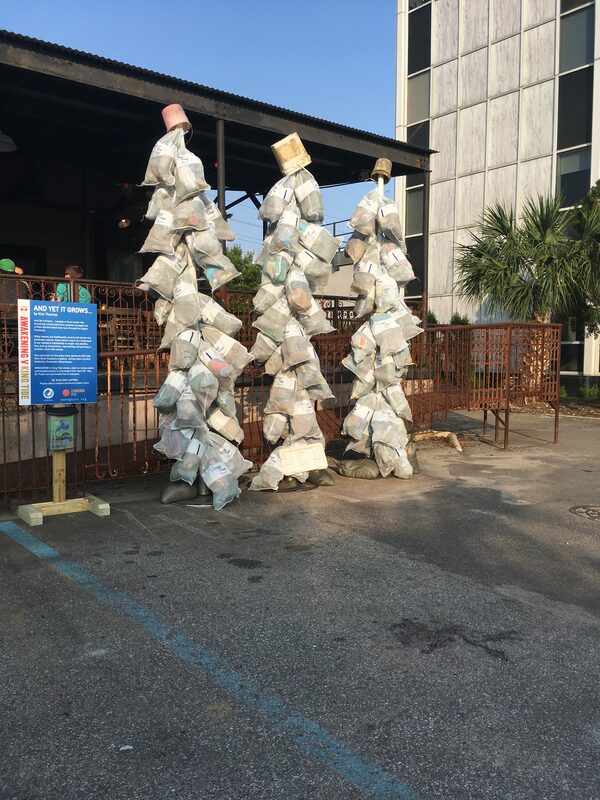 With support from students from Buist Academy, a large sculpture will be constructed using materials found during a series of New Market Tidal Creek clean-up days hosted by Awakening V: King Tide partner Charleston Waterkeepers. The piece will highlight that trash & plastics are not organic, and yet they are reproducing and growing. 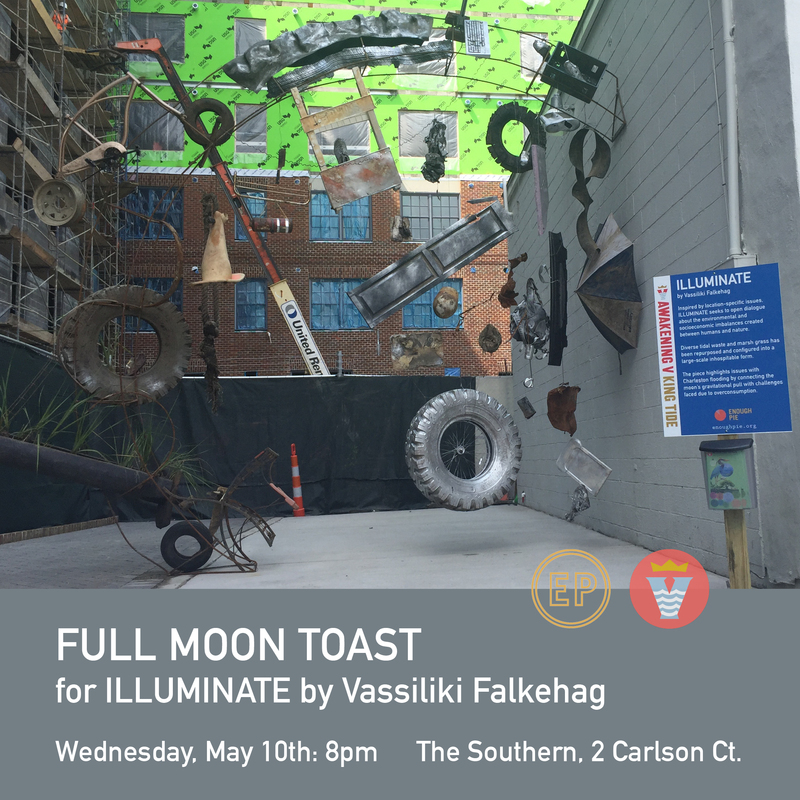 Working with the idea of site and local problems Vassiliki Falkehag’s exterior installation at The Southern Gallery consists of two parts. An intervention on the exterior gallery wall and a large, inhospitable form configured of diverse natural and artificial recycled materials. It comments on the real condition of flooding, creating a link between the moon’s gravitational pull causing rising tides and the challenges we are presently facing created by societal actions. The culmination of St. Julian Devine and Enough Pie’s weekly knitting circles will be displayed along the green space facing East Bay Street to show various levels of projected sea level rise by the year 2100. 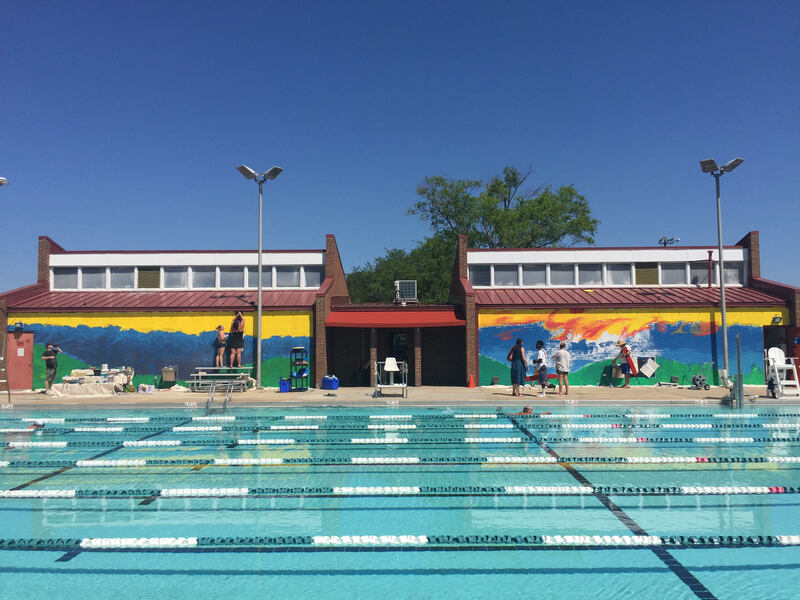 In partnership with The Nature Conservancy in South Carolina, a team of artists from around Charleston will create a large exterior murals at this historic City Pool. Turtles, dolphins, whales, schools of fish, octopus and coral reefs will come alive in this engaging space “under the sea” while offering teaching moments about bleached coral, plastics, and other challenges our oceans face. 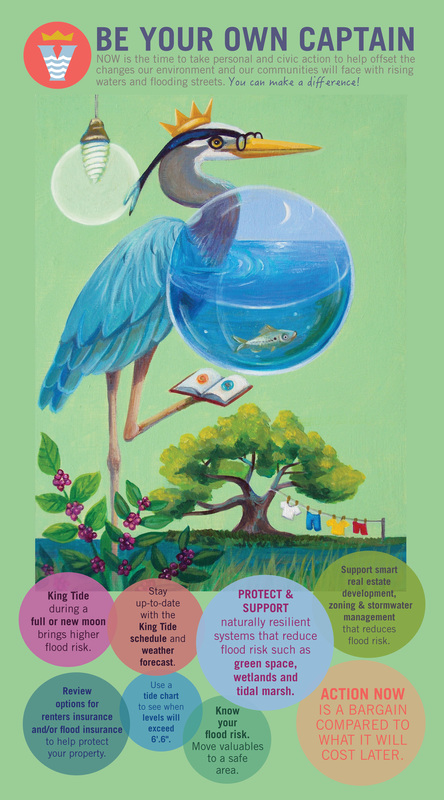 There will be an “I PLEDGE” section with three simple acts kids can commit to by putting their hand on a hand-print to pledge to do their part to keep the ocean healthy. For over two years, engineer and photographer Jared Bramblett has been documenting KING TIDE to show how king tides affect various areas of Charleston, SC. ‘Variable Boundaries’ is a photographic series exploring Charleston’s complex relationship with the seas and rising waters. This exhibit is sponsored by Davis & Floyd. Individuals include: Terri Anderson, Joyner Beasley, Sharon Bruner, Betsy Cake, Wes & Lindsay Carter, Charlotte Caldwell, Kirby Caldwell, Paul Cawood, Alyssondra Champaigne, Michael Cline, Jill Conway, Courtney Davis-Shoemaker, Debra Davidson, Nicki Davidson, Sterling Eason, Tami Enright, Molly Fienning, Terry Fox, Anne Frazier, Betsy Fuller, Leize Gaillard, Susan Gregory, Natalie Halt, Amy Horwitz, Stephen Hoffius, Stephanie Hunt, Pam Huseby, Amber Hussey, Kristin Hettermann, Jenny Horne, Kim Jahde, Glen and Ashley Jennings, Ted Keller, Brian & Liz King, Linda Ketner, Charlie Letts, Julien Libaire, Heather Mann, Caroline Mauldin, Katie McKain, Kim Miller, Lisa Moran, Elizabeth Morton, Nathalie Naylor, Kate Nevin, Sally Newman, Anne Parker, Whitney Powers, Katherine Richards, Leila Ross, Betsy Shuford, Shanequa Renee Singletary, Oliver Smith, Kris Westerson, Carolee Williams, Allison Williamson, Lindsay Windham, Rebecca Wodder and many anonymous donors. Thank you! Learn about our projects by clicking here! Email us at info@enoughpie.org to talk to us. Copyright All Rights Reserved © 2018 Enough Pie. What would you like to see happen in the upper peninsula? We want YOU to be engaged. Fill out the form and let us know!